A few small neighborhoods of single-family and duplex homes developed on the northside of Main Street, Frisco, in the meanders of Tenmile Creek. These subdivision have names like 5th Avenue Landing, Fourth Estates and River Pines. Walking from these homes to Main Street with skis on your shoulder is easy, and once there you'll find the route of the free county-wide bus system. Across the creek and up on the bluff is the Frisco Duck Sub. So too is Frisco Heights, which not officially incorporated into the town. The creek crossing is on more even grade on the west side of Frisco, and so neighborhoods like Frisco Park and Village are just a bridge over Tenmile Creek, and a few blocks away from all the restaurants and shops Frisco has to offer. From the northside, the commercial strip - Summit Boulevard - is closer and it would be an easy bike ride to the new Whole Foods. 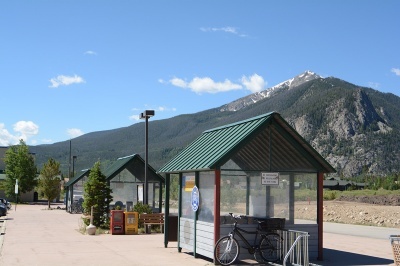 The bike path runs partially along this part of Frisco, and does connect with the county-wide network that extends from Breckenridge to Copper Mountain and to Keystone. Westerly, but just north of Main Street is the small King Solomen, single-family, infill subdivision, near the Backcountry Cabins. Conveniently located, too, are these nearby townhomes: Windstream Townhomes, and Galena Street Townhomes. Northside Condos are: Scattered Pines Condo, and River Glen Condos. The large town park called Walter Byron Park is situated along Tenmile Creek, and near it are public tennis courts. Frisco doesn't have its own rec center, but there is a pool usually available for public use at Summit Middle School. The Frisco Nordic Center grooms more trails and has more diversity of trail type than any other cross-country ski center in the county. Mountain biking at the Frisco Penisula, on the southeast side of town, is incredibly popular, and can be easily reached by norhtside dwellers by use of the bikeway. The north end of Frisco is bounded by I-70 so one must cross it to get to trails up to Lily Pad Lake and along the flanks of Buffalo Mountain and Uneva Peak. Tenmile trail begins just across I-70 at the western exit for Frisco. With national forest directly on the southern border of Frisco, trails head up Mount Royal directly from southside neighborhoods. Frisco isn't so big, and from some northside neighborhoods, it's only 4 or 5 blocks to a national forest boundary..